Last weekend was rather hectic (when is it not?). 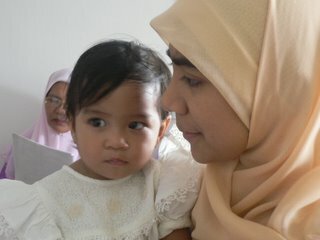 We all went back to Melaka to my in-laws for a 3-in-1 family gathering which was to celebrate Dina’s Qiqah. My sister-in-law’s wedding and Doa Selamat for my in-laws who are going to Mekah next month. Hubby and I took Friday off so we could help with all the preparations for Saturday’s event. 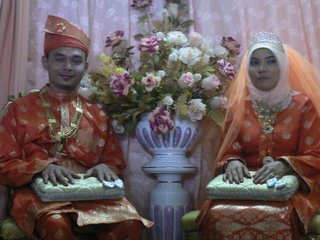 The agenda for Saturday was as follows; 10am – Marhaban and Dina’s Qiqah, 11am – Anom’s (my SIL) akad nikah, 12pm – Anom’s sanding. 3pm – End. I realize some of these terms may seem foreign to oversea readers. Here’s something to help you with the vocabulary. 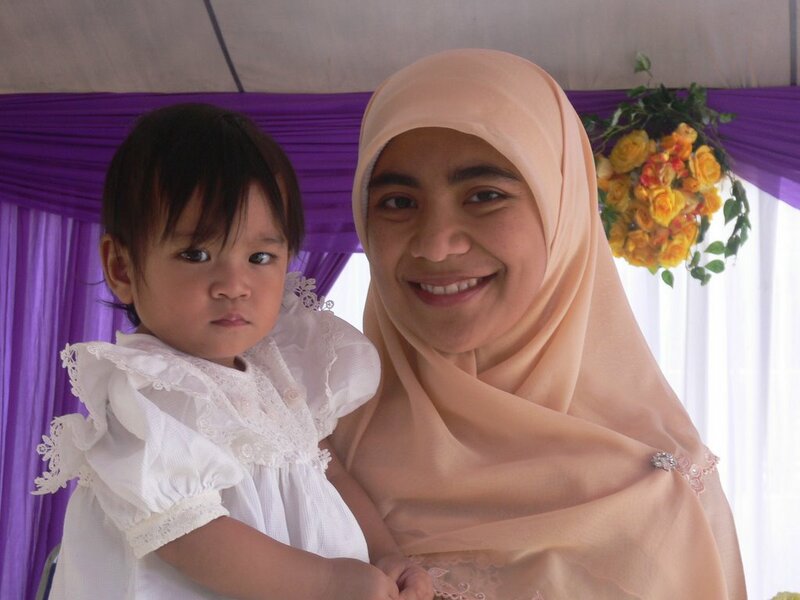 Qiqah – an Islamic ceremony to praise god and give thanks for new babies. Usually the ceremony is done when the baby is 7 days old. Nowadays, people do it when they can get leave from their ever hectic work life. The ceremony starts with Marhaban (a group of people singing versus from the Holy Quran) and then the cutting of the hair of the baby. Pictures of Dina going through this process as below. Dina with a full head of hair, before the ceremony. The gown she's wearing was a hand-me-down from Dania. Thank God it fit her. 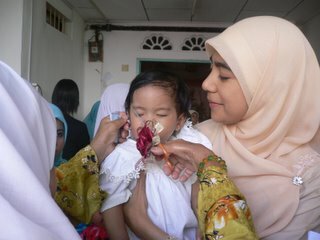 Where are there so many old ladies here, ibu? What does she think she's doing with that pair of scissors?!!" This is not nice!! I REPEAT, this is not nice!! Please, kind lady. Have mercy on this defenseless little girl..sob, sob. As you can see, it started out good, then towards the end she got tired and irritated because these old ladies kept grabbing her hair and putting weird coconut juice all over her head. One can only take so many cheek pinches in single day!! 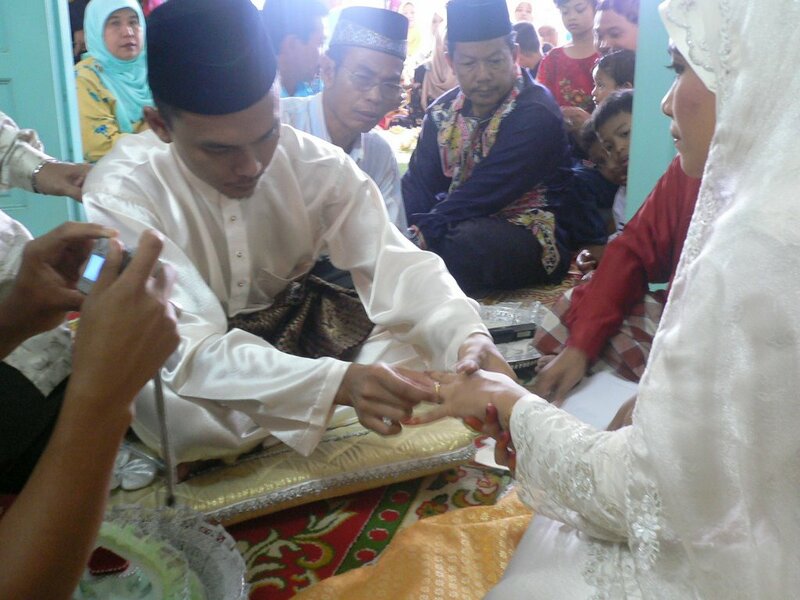 Akad Nikah – basically it’s the ceremony where the couple officially becomes husband and wife. It’s the Islamic version of “Do you take so-and-so as your wife, blah, blah, blah......I Do”. No kissing scene though. 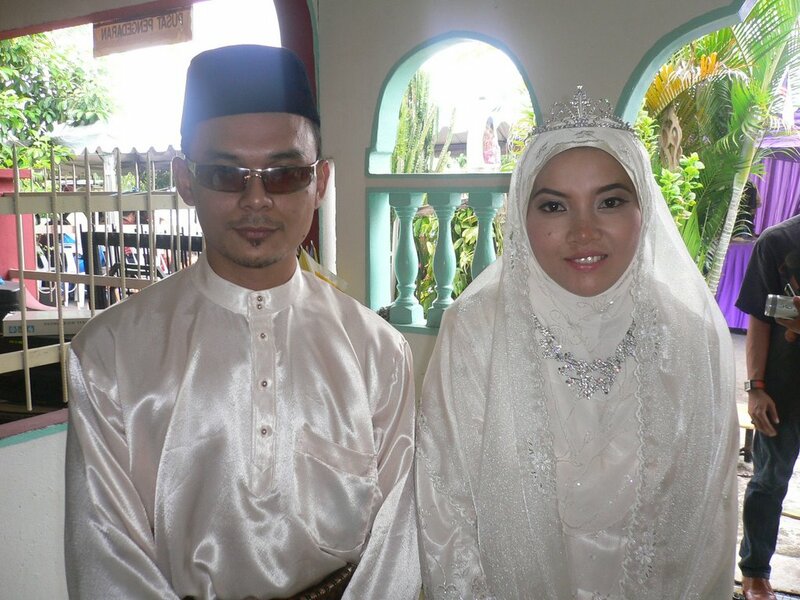 I cried during my akad nikah. Silent tears of joy and anxiety. 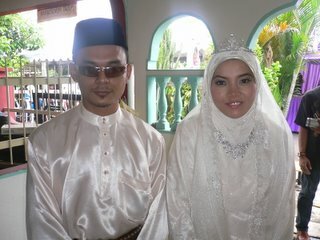 Pictures of my SIL’s akad nikah as below. Sanding – the part of the ceremony where the bride and the groom sit up on a platform and relatives and friends come up to wish and bless the couple good luck. Pictures as below. Doa Selamat – means prayer for someone’s well-being. My parent-in-laws are going to Mekah end of December. Here’s praying they go and come back safely. Blogging. Or rather finding the time to blog. I can’t blog at work because of the massive pile of camel dung I have to go through everyday. I can’t blog at home coz I’ll feel guilty for not spending those precious minutes with the girls. Blogging after they’ve gotten to bed cuts into quality time with hubby...or rather the TV. Sigh...what’s a former blogger to do? Did I say former? NO...I’m not going away. Not permanently. I guess I’ll be dropping in less frequently. Pictures of Raya coming up soon. And by soon I mean before 2006. Sorry for the long silence folks. It’s the holiday season and I’ve been away from the office for…not long enough. I’m typing this from home, so in between watching The Incredibles with Dania for the 11 hundredth time and playing hide and seek with Dina, I’ve decided to update you guys with how we spent our Raya. Oh, before that, I want to wish all Muslims around the world Selamat Hari Raya AidilFitri, Happy Eid Mubarak. Please forgive me for all my wrongdoings, intentionally or unintentionally. Nobody’s perfect, you know..and I’m certainly am not nobody. Hehehe, but on a serious note, hope everyone had a safe holiday. Raya was ok for us this year. This year we spent it with my side of the family first, which meant over to my grandma’s house in Keramat. Everyone was there; my parents, my brothers, all my aunts and uncles, my cousins. I took a few pictures, which I’ll upload once I get back in the office next week. Around 5pm, we headed back to my in=laws house in Melaka. Traffic was minimal so we made in record time. Once there, we all took a breather then headed out with my SILs to visit an aunt of hubby’s. We stayed there for a few hours then returned back for bed. The next day, we all headed out to visit relatives of my FIL in Muar. Going there, traffic was ok but coming back we were unfortunate enough to get stuck in a jam. I think there was some kind of accident or something, coz we were moving an average of 10km/hr. Thank god, the kids were like angels and didn’t make a peep the entire trip. On day 3, my MIL invited her relatives over to the house for makan-makan. We cooked chicken rice, recipe courtesy of Me (hehehe), prawn cooked in chili sauce, rending and other delicacies. Since my parents and brothers were also in Melaka, over at my aunt’s house, my Mil invited them too. After eating, we (my family, my parents and my brothers) headed to Chaah to visit my dad’s younger sister. We arrived around 8.30pm, had dinner and settled down for the night. At least everyone else but me, that is. Dina, being in a new environment, wanted to explore every nook and cranny of my aunt’s house. She just wouldn’t go to sleep. Finally I had to bring her upstairs and quarantine her in my cousin’s room. We went to sleep around 1.30 AM. Haiya!! Day 4 was tiring to say the least. Getting everyone ready and out of the door was one thing, Imagine 8 adults, 8 teenagers, 2 toddlers plus one grandma…and only two bathrooms!! Finally when everyone was ready, we headed off to Keratong so visit my dad’s stepbrother. Then we headed back to Segamat to visit my dad’s elder brother. Then we headed to Batu Pahat to visit my dad’s stepsister. My parents and brothers went back to Chaah to stay another night, but we all headed back to my in-laws. We arrived around 2am. Tired, was putting it mildly. Day 5 was supposed to be a day of rest but my MIL wanted to visit her sisters and uncle so we headed out after lunch. We ended up at my aunt’s house for tea. Around 8pm, we all headed back home. As you can see, it was a lot of traveling around and meeting relatives we hadn’t seen in a long time. It was tiring but fun. It made me feel so lucky to have lots of loving relatives. The girls collected a lot of duit raya…hehehe. I’ll be sure to put it all into their bank accounts soon. How was your raya? Hope it was fun.